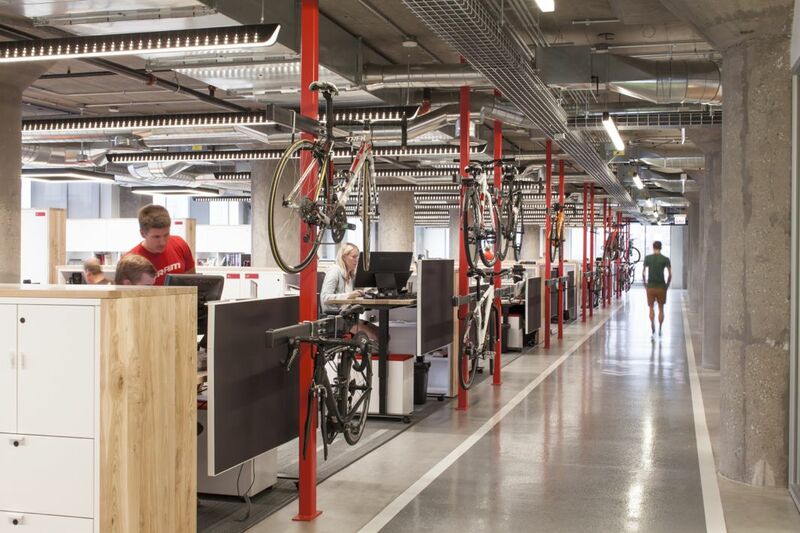 SRAM headquarters in Chicago is the place, where cycling culture meets urban design at its absolute finest. The world’s second largest manufacturer of bike parts has transformed a former cold storage warehouse into a unique and multifunctional bike-friendly workspace. No detail was spared, from the bike-tapped door pulls to the incorporated storage facilities, this space embodies cycling. SRAM’s signature red color and brand imagery, combined with an ace architectural strategy from the Perkins+Will design firm, creates a striking and immersive environment. 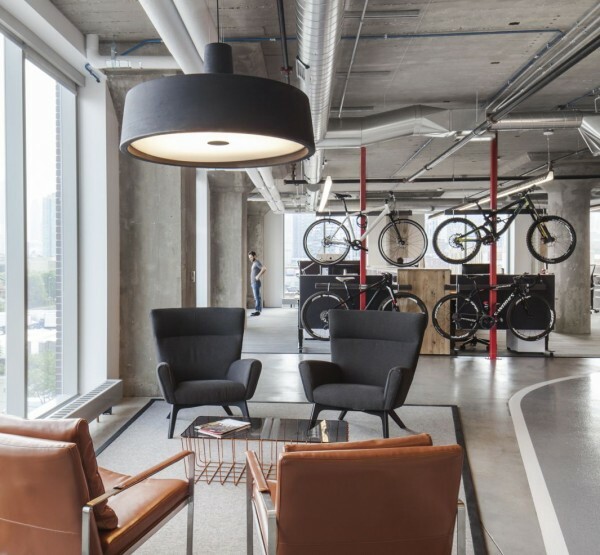 Aesthetically and functionally on point, this space rewards the 89 percent of employees who choose cycling as their way of commuting, with bike poles built right into their cubicles. The company obviously understands the importance of keeping your ride in a good shape. The Employees have access to a common area that includes bike storage, a tire-filling and bike cleaning area, a common bench with all the tools that the conscientious cyclist might require, in addition to locker rooms, and showers. SRAM even went as far as building their very own 1/8-mile test track linking all the open office spaces together. Thus allowing the prototypes to be tried out on site. By creating this open and collaborative atmosphere, the company has established themselves as a pioneer in regard to taking on the mission of bicycle advocacy first hand. 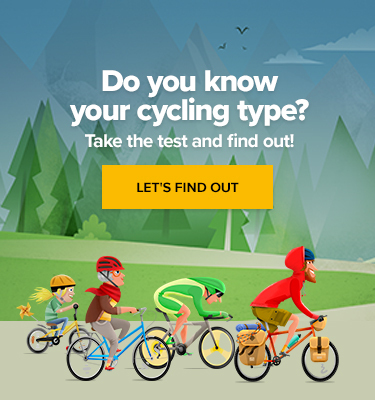 When it comes to cycling activism, what better place to start than at the source? Let’s hope this revolutionary project starts a trend in encouraging other companies to make their offices friendly for bikes and their riders alike.